Cabin in the Heart of Lake Tahoe California is a detached holiday home situated in Al Tahoe in the California Region and is 700 metres from South Lake Tahoe. Guests benefit from terrace. There is a seating area a dining area and a kitchen complete with a dishwasher and an oven. Towels and bed linen are available in this self-catering accommodation. There is a private bathroom with a bath. Carson City is 31 km from Cabin in the Heart of Lake Tahoe California while Stateline is 5 km away. 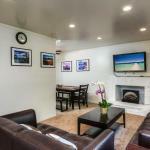 The nearest airport is Reno-Tahoe International Airport 65 km from the property.